It seems that working in theatre brings with it a healthy amount of superstition and reliance on rituals. 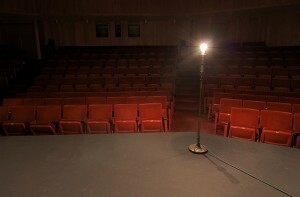 The Ghost Light: Most American theaters have a ‘ghost light’ which is switched on when everyone leaves for the night. Usually a single bare light bulb on a stand, it remains lit until the crew arrive the next day. There’s some more information about it on the Ghost Light page. The Palace Theatre had two seats permanently bolted open (and unusable by the public) for the theatre ghosts to sit in, until Harry Potter arrived. There’s been no noticeable increase in ghostly activity since. The Adelphi Theatre hosts the ghost of the melodrama actor William Terris, who was fatally stabbed on his way into the theatre in December 1897. In the early days of spectacular theatre, a system of whistles was used by the stage crew to communicate with the rigging crew, meaning a misplaced whistle could bring a backdrop flying onto you as you walked across the stage. Whistling is, therefore, seen to be unlucky, and should be avoided around theatre veterans! The name of the show or the lead character should not be mentioned in a theatre. The play should be referred to as ‘The Scottish Play’. More on the The Scottish Play. The number 13 is seen (in Western culture) to be unlucky, so theatres will rarely have a dressing room numbered 13. Wishing ‘Good Luck’ in a theatre, particularly before an opening night, is to be avoided. Use the phrase ‘Break A Leg!’ instead. These are said to feature an image of the ‘evil eye’ and any use of peacock feathers on stage will curse the show. As breaking a mirror is said to give 7 years bad luck to the unfortunate soul who commits the act, avoiding mirrors on stage is a good way of reducing the risk. Acrylic mirrors are assumed to be perfectly fine, as A Chorus Line is still doing well!